Posted by dissident93 in Iraq mortality, Medialens, Project Censored. Anyone who consults the available research will recognise that there’s no scientific consensus supporting the “one million deaths” claim, but several influential websites (Project Censored, Just Foreign Policy, Medialens, etc) present it as if there is a supporting consensus. Of course, this is disingenuous. Medialens have not “simply reported the most credible scientific advice”. They’ve reported one peer-reviewed study (and one unrefereed poll)** and ignored (or overlooked) at least five peer-reviewed studies (plus several critical reviews by leading researchers). *** And all the research they’ve ignored (or overlooked) coincidentally does not support their statement that “1.2 Million Iraqis Have Been Murdered”. Curiously, Medialens also write: “It seems clear that the Lancet figure of 655,000 deaths, although now a year out of date, was accurate”. Clear to whom? Few “credible” scientific researchers share Medialens’s “certainty” over the accuracy of this figure. Most in fact are honest enough to admit they are unclear over the real number of deaths. * Email from David Marker to me (6/11/08). I’d asked him if he was aware of any scientific consensus supporting the “over one million deaths” claim. ** Medialens cite the Lancet 2006 study (peer-reviewed) and the ORB poll (which isn’t peer-reviewed science). *** For example see Leading researchers disagree with Project Censored. Perhaps Medialens should work harder to live up to the Chomsky quotes with which they attempt to ridicule others. They’re certainly offending a lot of people (eg George Monbiot, Nick Davies, Stephen Soldz), but not the ones who really “ought” to be offended. The Observer’s foreign affairs editor (who opposed the war) described Medialens’s campaign against IBC as “deeply vicious”. 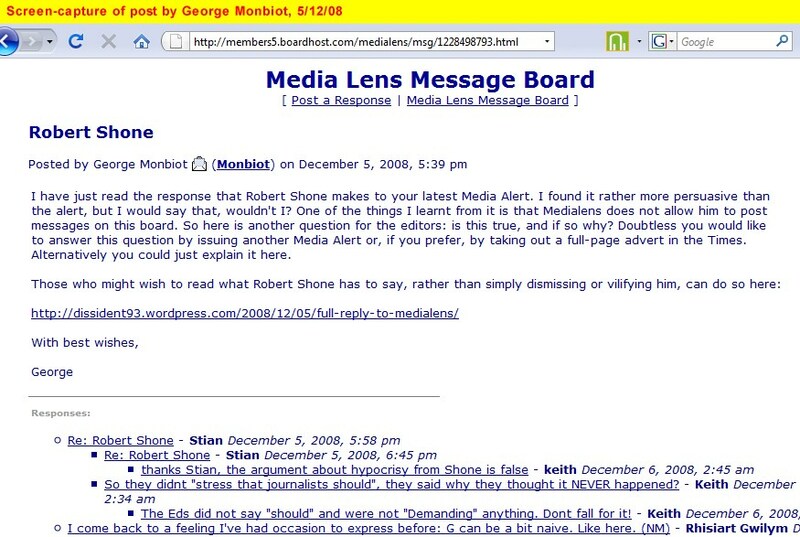 Medialens prompts its readers to send emails to journalists and others. The Medialens editors then copy the “best” of these emails to their message board, partly to show how rational, coherent, informed and polite their readers are. (They once wrote that their readers’ emails were “awesomely polite”). An example is given below. It was an email sent to Iraq Body Count (in response to a Medialens “alert” on IBC). It’s fairly typical, and carries the seal of approval of the Medialens editors (who posted it). It’s also so incoherent and irate that I’ve added a brief translation, to save you the strain of extracting meaning from the static. I must say I am shocked after reading the Media Lens investigation into your reported figures, not so much by their apparent inaccuracy, but by the fact that you are not fighting your corner! I would expect you to loudly and angrily protest that your figures are indeed accurate and explain why. If you cannot do this then should be utterly ashamed of yourselves. Instead you are mumbling about changing things in the future. Why are you even bothering? If you can’t (or more likely won’t) produce even approximately accurate figures, what is point of continuing? To put it bluntly, you’ve been rumbled, but instead of closing down the site, or updating and explaining the gross inaccuracy of your figures, you’re just carrying on as normal. History doesn’t record what the Emperor did when it was obvious he was naked, but I bet he didn’t carry on with the procession. Your figures are apparently inaccurate. I would expect you to loudly and angrily protest that your figures are indeed accurate and explain why. Instead of explaining the gross inaccuracy of your figures, you’re just carrying on as normal. Mr Gibbons provides no examples of any figures, so it’s difficult to judge their accuracy or inaccuracy. * But as the Medialens editors explained, it’s really remarkably shameful that IBC didn’t interrupt their work on Iraqi deaths to provide a full response to Mr Gibbons’s “rational questions”. [The multiple Medialens “alerts” targeting IBC]. The vicious smears about IBC “aiding and abetting in war crimes”, etc. The insinuations that IBC don’t “care” about the suffering of Iraqis. The slurs that they “bask in the glow of war apologists”, etc. The discrediting of [IBC’s John] Sloboda by digging up old pieces quoted out of context. The suggestions that IBC “shut down”. The insinuations that they were behaving in a “suspicious” way. The claims that they were “deliberately” letting their work be “misused”. The accusations of “complicity” in mass slaughter. The nasty personal insults (examples available on demand). The unsupported claims that IBC are “cosy with” military/intelligence. The claims that IBC were “assisting the US government”. The moral sermonising “the honourable thing to do…”. The accusation that IBC “undermined” the work of others. The endless stuff about “you’ve been rumbled”, etc. The claims that IBC “actively endorsed” misquotes of their work. The absurd credentialism (“he’s only a guitarist”). The personal character assassinations of John Sloboda. The smears about propaganda for war criminals. The surreal insistence of peer-review for IBC’s defense of itself against against the above. * Refers to the 2006 attempt, by Lancet 2004 co-author Les Roberts, to run for US Congress. ** See my ZNet article which catalogues Medialens’s errors. *** Refers to errors by Les Roberts (and admitted as such by Roberts) on which some of the main claims in Medialens’s alerts were based. For further details, see IBC’s Speculation is no substitute. Others have been critical of Medialens’s campaign. Peter Beaumont of the Observer described it as “deeply vicious”. Robin Beste, of Stop The War coalition, wrote of his impression “that IBC was being excessively hounded” (in an email cc’d to me, 28/3/06).